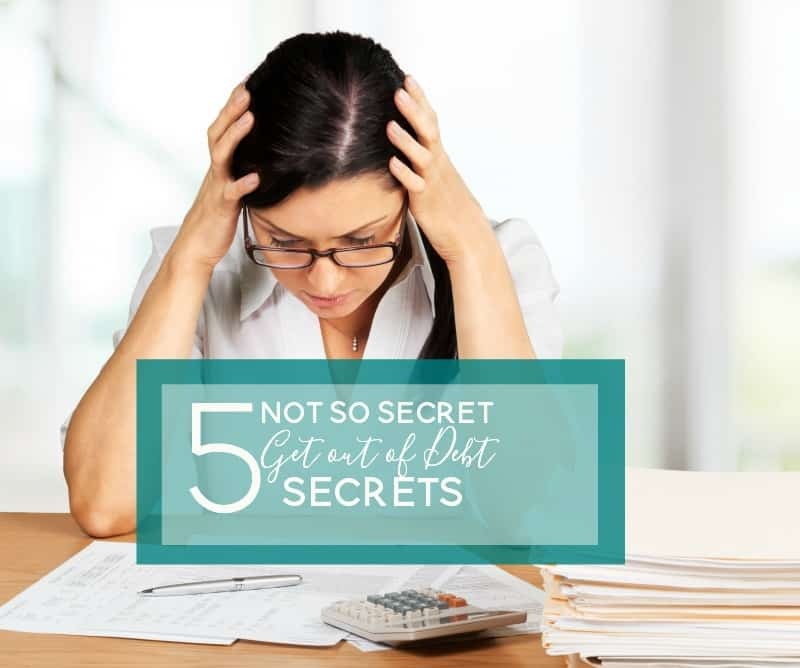 As we continue on our journey to wipe out debt, today I want to share five easy get out of debt secrets. I could also call these not so secret secrets, but we’ll leave them as is. The reason I want to share these is because I want all of us, who are struggling with debt, to become debt free. This was not something that we wanted for ourselves, but somehow we ended up here. And if we got ourselves into this mess, we can get ourselves out of this mess- and stay out of it so we can prevent this from happening again. When times are tough, it can be difficult to make payments on the things we need. And when we run up a lot of debt for unnecessary things, it can get out of control in a hurry. It’s enough to make us long for simpler times, when we didn’t have as much but weren’t buried underneath a mountain of debt. But if you catch the problem early, you can turn things around. It will require a change in your spending habits and attitude toward debt, but in most cases you won’t have to make big sacrifices. And the payoff is a life with much less stress – something money just can’t buy. Here’s how to get the debt monkey off your back. * Create a get out of debt budget that tells you how much you have coming in each month and what you spend it on. Be honest – no one is keeping score. In order to make a change, you need to have a realistic picture of the current state of your finances and where your money is going. * Look for things you can cut out of the budget completely. It doesn’t matter if they’re large or small, just go through and look for the things that you can easily live without. It could be that cappuccino that you get on the way to work every morning, or that monthly car detailing that you could do yourself, or anything else that wouldn’t make much of a difference in the grand scheme of things. * Find ways to cut back on luxuries. If you go out to dinner with your spouse twice a month, cut back to once a month. If you have an expensive cable package, consider getting one with fewer channels. These measures will save you money without leaving you feeling totally deprived. * Redo your budget with the above adjustments included, and see how much you will save. Then reallocate those funds toward paying off your debts. * See how much you can shave off of your budget by utilizing coupons and other discounts. Clipping coupons and taking advantage of sales can save you a surprising amount of money at the grocery store and many of the other places you shop. Keep a record of how much you save, and put that amount toward paying off your debts, too. If you take these easy get out of debt secrets, you’ll barely notice the difference in your day-to-day life. But after a few months, you will notice a marked decrease in your debts. And less debt equals less stress, which makes life so much more enjoyable.